concerns intra-canonical contradictions, one that raises questions of theological plurality, and one that concerns historicity. 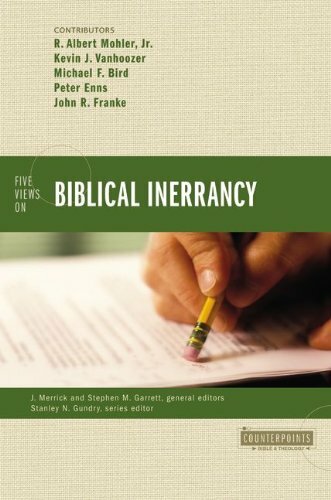 Five Views on Biblical Inerrancy serves not only as a single-volume resource for surveying the current debate, but also as a catalyst both for understanding and advancing the conversation further. Contributors include Al Mohler, Kevin Vanhoozer, Michael Bird, Peter Enns, and John Franke. Kevin Vanhoozer is Research Professor of Systematic Theology at Trinity Evangelical Divinity School.James K. A. Smith is Associate Professor of Philosophy and Director of Seminars in Christian Scholarship at Calvin College.Bruce Ellis Benson is Associate Professor of Philosophy at Wheaton College.Kevin Vanhoozer is Research Professor of Systematic Theology at Trinity Evangelical Divinity School.James K. A. Smith is Associate Professor of Philosophy and Director of Seminars in Christian Scholarship at Calvin College.Bruce Ellis Benson is Associate Professor of Philosophy at Wheaton College. Michael F. Bird is lecturer in theology at Ridley College in Melbourne, Australia. Previously he served at Crossway College in Australia and Highland Theological College in Scotland. He is the author of several books, including Jesus and the Origins of the Gentile Mission and The Saving Righteousness of God: Studies on Paul, Justification and the New Perspective, as well as numerous essays, articles and reviews.